A major new campaign of disinformation around Brexit, designed to stir up U.K. ‘Leave’ voters, and distributed via Facebook, may have reached over 10 million people in the U.K., according to new research. The source of the campaign is so far unknown, and will be embarrassing to Facebook, which only this week claimed it was clamping down on “dark” political advertising on its platform. 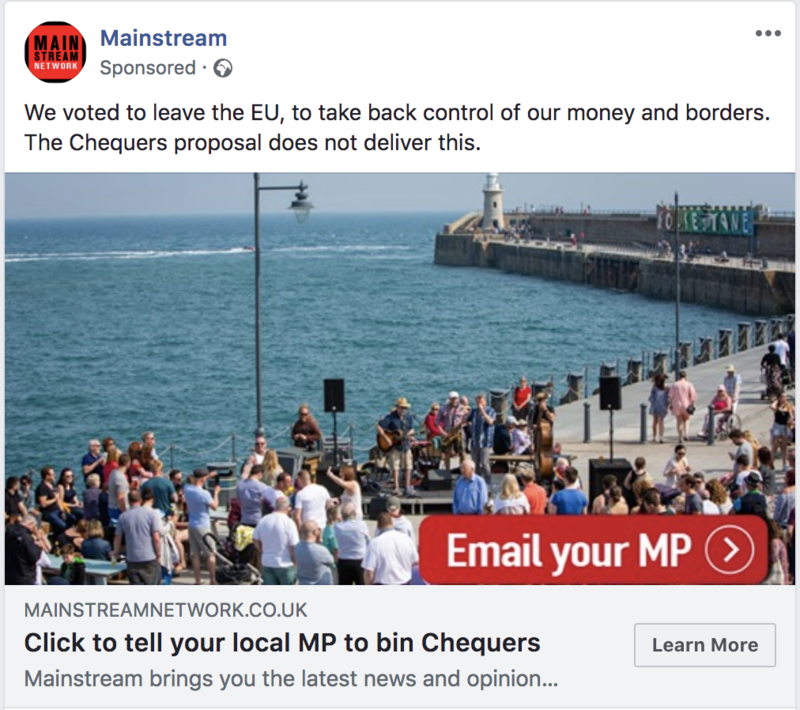 Researchers for the U.K.-based digital agency 89up allege that Mainstream Network — which looks and reads like a “mainstream” news site but which has no contact details or reporter bylines — is serving hyper-targeted Facebook advertisements aimed at exhorting people in Leave-voting U.K. constituencies to tell their MP to “chuck Chequers.” Chequers is the name given to the U.K. Prime Ministers’s proposed deal with the EU regarding the U.K.’s departure from the EU next year. 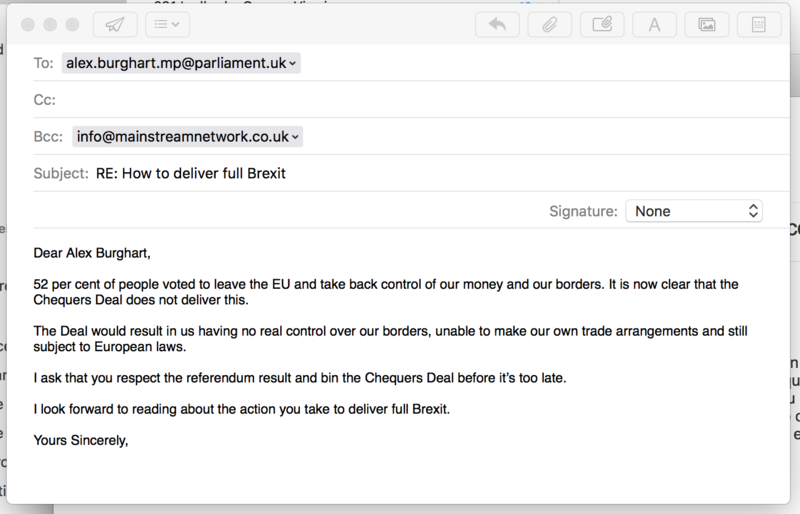 89up says it estimates that Mainstream Network, which routinely puts out pro-Brexit “news,” could have spent more than £250,000 on pro-Brexit or anti-Chequers advertising on Facebook in less than a year. The agency calculates that with that level of advertising, the messaging would have been seen by 11 million people. TechCrunch has independently confirmed that Mainstream Network’s domain name was registered in November last year, and began publishing in February of this year. 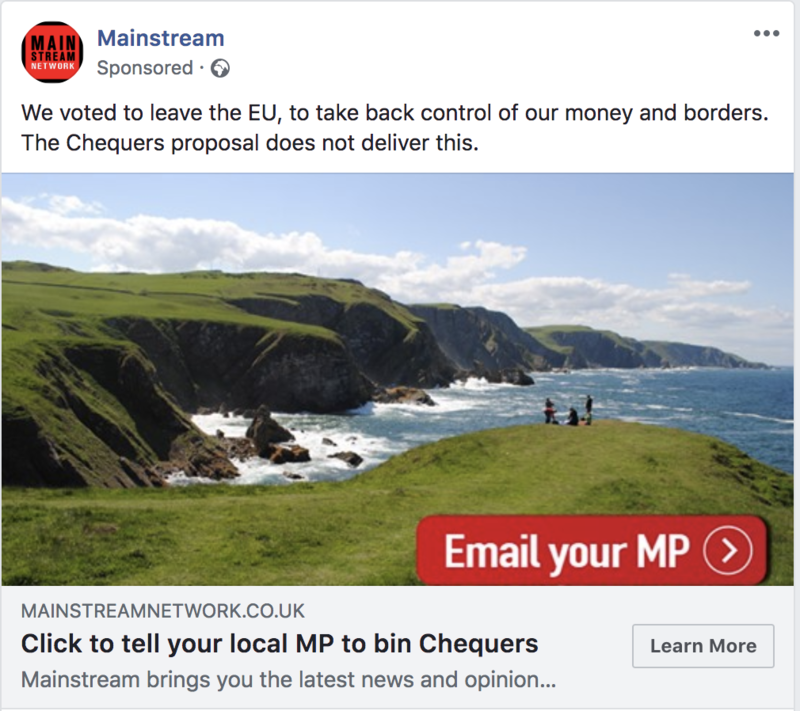 In evidence given to Parliament’s Digital, Culture, Media and Sport Select Committee today, 89up says the website was running dozens of adverts targeted at Facebook users in specific constituencies, suggesting users “Click to tell your local MP to bin Chequers,” along with an image from the constituency, and an email function to drive people to send their MP an anti-Chequers message. This email function carbon-copied an info@mainstreamnetwork.co.uk email address. This would be a breach of the U.K.’s data protection rules, as the website is not listed as a data controller, says 89up. The news comes a day after Facebook announced a new clampdown on political advertisement on its platform, and will put further pressure on the social media giant to look again at how it deals with the so-called “dark advertising” its Custom Audiences campaign tools are often accused of spreading. The agency says that once users are taken to the respective localized landing pages from ads, they are asked to email their MP. When a user does this, its default email client opens up an email and puts its own email in the BCC field (see below). It is possible, therefore, that the user’s email address is being stored and later used for marketing purposes by Mainstream Network. TechCrunch has reached out to Mainstream Network for comment on Twitter and email. A WhoIs look-up revealed no information about the owner of the site. TechCrunch’s own research into the domain reveals that the domain owner has made every possible attempt to remain anonymous. Even before GDPR came in, the domain owners had paid to hide its ownership on GoDaddy, where it is registered. The site is using standard GoDaddy shared hosting to blend in with 400+ websites using the same IP address. TechCrunch has reached out to both Facebook and Mainstream Network for comment prior to publication and will update this post if either respond to the allegations. ← Domio just raised $12 million in Series A funding to build “apart hotels” across the U.S.
You’re a travel agent! You’re a travel agent! Everyone’s a travel agent!